We're already 15 days into TAR14 and have not had a sighting since Brasov Romania on Nov 5th and thanks to romaniafan's info they stayed there for 3 days then, whether production crews or teams went to Russia, again thanks to romaniafan, remains to be seen. We have lost the trail *sigh* but more sightings will be discovered our detectives are . 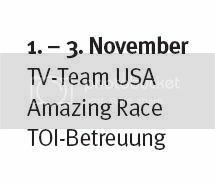 If TPTB continue with the 20-23 day race schedule the teams should be back, the 20th -22nd give or take which is roughly a week away OMG! BvM was 'scouting Asia' for TAR14 locations during his Tar13 interviews, so I expect there will be at least a leg or two there somewhere. Well, since races usually end on Saturday mornings I'm going agree with puddin in saying that the race ends on November 22nd, a week from today, on Saturday morning. I have faith!! And if anyone knows something and should want to chat, you'll find us to be all ears! Ok. I had always heard that and went "yeah yeah it's probably ok", but it really is a great place. Beautiful view, cool people and great food. Oh yeah, plus I was drinking $3 Long Island Iced Teas last night. I am in the hotel internet, so it is kind of expensive and I don't want to be long. Exciting news- on my domestic flight going Bangkok- Phuket, the Amazing Race contestents caught the same flight. And as I expected it's all a shame. Camera crews set up and take multiple shots of them running to the ticket counter, and then they got off the plane and ran down the stairs, only to get held up by customs. Stupid f'cking Americans. Ahh they were wankers. They yelled at the Air stewardess because their large cameras didn't fit in the overhead lockers, they walked around the plane the whole flight to be sure no one was filming them and they were the biggest bunch of knobs. But hey what do you really expect from American reality shows?? So TAR 14? In Phuket?? Oh happy days!! Oh someone would have found it eventually. Thanks to dhall's sighting this has to be us!! I wonder if sham was meant. btw, since they're now in Phuket, Thailand, I heard that this city will be the final city for the final episode of TARA 3. But, imho, that season is a bit lame just like on TAR 13 right now and I still like the previous season [TARA 2 and TAR 12]. Phuket, Thailand, is commonly referred to as the ‘Pearl of South’ and is the largest island in Thailand. Phuket Island runs 48 kilometers (34 miles) north to south and 21 kilometers (16 miles) east to west. Phuket is broken by a chain of mountains and valleys mainly from a north-south range running down the west coast. This accounts for about 70% of the land area. The tallest peak, Mai Tao Sip Song (12 Cane Peak) is 529 meters. The other 30% of the island is flat land located mainly in the central and eastern portions of the island. Laying in the Andaman Sea off southern Thailand’s west coast, the island’s terrain is incredibly varied, with rocky headlands, long broad sandy beaches, limestone cliffs, forested hills, small estuaries, lagoons, and tropical vegetation of all kinds. Its large size has allowed microclimates to develop in different areas of the island. The island offers many different looks and feels for you to discover and enjoy. Kata Beach with its spectacular tropical scenery compared with the stately cassurina trees that are found on Nai Yang Beach just a few kilometers north. The triple canopy rainforest of Khao Phra Thaeo National Park to the mud flats and mangrove swamps of Koh Siray. Limestone outcroppings line the east coast and solid granite boulders on the west. Phuket is truly a tropical wonderland and offers something for just about everyone. To help you find your way around the island this web site divides the island into five geographical areas Patong Beach, South Coast Area, Phuket Town, North Coast Area, and the North Central Area. It is organized around and gives directions from the Patong Beach area because the majority of visitors are located there. Those staying in the Kamala Beach area north of Patong or the Kata Beach and Karon Beach areas to the south should be able to easily make the necessary adjustments for distance and travel time. Phuket Cruises, Phuket Elephant Trekking, ATV Tours, White Water Rafting , Phuket Golf and Simon Cabaret are major actiities available in the Phukey area. "We caught a team of Amazing Race show on our train to Interlaken!" picture taken on Nov 2, 2008! Why do I think I've seen them before? was there any blog associated with the photo? No just a photo. 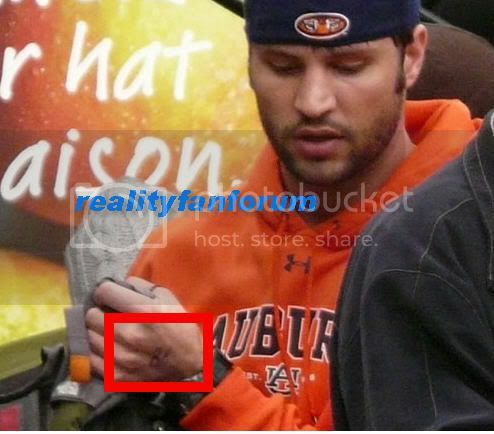 Hes wearing a Auburn shirt as in Georgia. I love Interlaken. I'm glad they might get to go there. Ahem. Auburn is Alabama, lol. And we just beat the pants off them today in football! TOI is Tourismus Interlaken, and "care," I'm guessing, is the group or committee that's tasked with handling WRP. From this link/PDF and then translated web page.